^ MacKenzie 1995, pp. 9–10. ^ MacKenzie 1995, p. 22. ^ MacKenzie 1995, pp. 22–23. ^ MacKenzie 1995, pp. 23–24. ^ MacKenzie 1995, pp. 24–33. ^ MacKenzie 1995, p. 27. ^ Albertini 2005, pp. 291–292. ^ Albertini 2005, pp. 364–480. ^ MacKenzie 1995, pp. 36–37. ^ Albertini 1953, pp. 19–23. ^ Dedijer 1966, pp. 236–270. ^ Dedijer 1966, p. 243. ^ Dedijer 1966, pp. 203–204. ^ a b Albertini 1953, p. 50. ^ Dedijer 1966, p. 285. ^ a b Dedijer 1966, p. 9. ^ Dedijer 1966, p. 286. ^ Taylor 1963, p. 13. ^ Albertini 1953, pp. 11–17. ^ Albertini 1953, pp. 87–88. ^ Albertini 1953, p. 49. ^ Isabelle Dierauer (16 May 2013). Disequilibrium, Polarization, and Crisis Model: An International Relations Theory Explaining Conflict. University Press of America. p. 88. ISBN 978-0-7618-6106-5. https://books.google.com/books?id=GCuDsecLWmYC. ^ a b Dedijer 1966, p. 11. ^ Dedijer 1966, p. 9; 12. ^ King, Greg. The Assassination of the Archduke. pp. 168–169. ISBN 978-1-4472-4521-6. ^ a b c Dedijer 1966, p. 12. ^ Albertini 1953, p. 35. ^ Dedijer 1966, Chapter XIV, footnote 21. ^ Malmberg, Ilkka: Tästä alkaa maailmansota. Helsingin Sanomat monthly supplement, June 2014, pp. 60-65. ^ Dedijer 1966, pp. 318–320; 344. ^ a b Albertini 1953, pp. 36–37. ^ Dedijer 1966, pp. 13–14. ^ a b Buttar, Prit. Collision of Empires. p. 282. ISBN 978-1-78200-648-0. ^ Dedijer 1966, p. 15. ^ Butcher 2014, p. 277; この写真はプリンツィプ逮捕の模様を写したものとされることが多いが、現代の歴史家は、連行されているのは現場に偶然居合わせたフェルディナント・ベーア（Ferdinand Behr）という人物であると考えている. ^ Owings 1984, pp. 67-8. ^ MacMillan 2013, pp. 517-518. ^ a b c d e f MacMillan 2013, p. 518. ^ Dedijer 1966, p. 346. ^ Albertini 1953, pp. 37–38. ^ Albertini 1953, p. 38. ^ Albertini 1953, p. 45. ^ Albertini 1953, pp. 120-1. ^ Reports Service: Southeast Europe series. American Universities Field Staff.. (1964). p. 44. https://books.google.com/books?id=QGtWAAAAMAAJ 2013年12月7日閲覧. "... the assassination was followed by officially encouraged anti-Serb riots in Sarajevo and elsewhere and a country-wide pogrom of Serbs throughout Bosnia-Herzegovina and Croatia." ^ Kasim Prohić; Sulejman Balić (1976). Sarajevo. Tourist Association. p. 1898. https://books.google.com/books?id=QVdpAAAAMAAJ 2013年12月7日閲覧. "Immediately after the assassination of 28th June, 1914, veritable pogroms were organised against the Serbs on the..."
^ Johnson 2007, p. 27. ^ Novak, Viktor (1971). Istoriski časopis. p. 481. https://books.google.com/books?id=To9pAAAAMAAJ 2013年12月7日閲覧. "Не само да Поћорек није спречио по- громе против Срба после сарајевског атентата већ их је и организовао и под- стицао." ^ Mitrović 2007, p. 18. ^ Gioseffi 1993, p. 246. ^ Donia 2006, p. 125. ^ Documents Diplomatiques Francais III Serie 1911–14,3, X Doc. 537. This document notes that the diplomatic cable was forwarded to the Secret Service of the National Security Department to investigate the matter of the January 1914 irredentist planning meeting in France but the Secret Service did not report back. ^ Owings 1984, p. 170. ^ a b Albertini 1953, pp. 50-1. ^ a b Owings 1984, p. 56. ^ a b Albertini 1953, p. 68. ^ Owings 1984, pp. 527–530. ^ Dedijer 1966, pp. 345–346. ^ Dedijer 1966, p. 343. ^ MacKenzie 1995, p. 53. ^ MacKenzie 1995, p. 72. ^ MacKenzie 1995, pp. 56–64. ^ MacKenzie 1995, p. 2. ^ MacKenzie 1995, pp. 344–347. ^ Dedijer 1966, p. 398. ^ MacKenzie 1995, pp. 329; 344–347. ^ MacKenzie 1995, p. 392. ^ Albertini 1953, pp. 80–81. ^ a b Albertini 1953, p. 273. ^ Albertini 1953, pp. 285–289. ^ Albertini 1953, p. 373. ^ Albertini 1953, pp. 461–462; 465. ^ Albertini 1953, p. 460. ^ Manfried, Rauchensteiner. The First World War and the End of the Habsburg Monarchy, 1914-1918, p. 27 (Böhlau Verlag, Vienna, 2014). ^ Tuchman 2009, p. 85. ^ Sugar 1999, p. 70. ^ ユリウス暦での表記。グレゴリオ暦の6月28日はユリウス暦の6月15日に当たる。不破哲三．戦争と帝国主義．東京，新日本出版社，1999年10月，398p.．レーニンと『資本論』 ; 4．ISBN 978-4-406-02684-0．p. 24. Albertini, Luigi (1953). Origins of the War of 1914. II. Oxford: Oxford University Press. OCLC 168712. Albertini, Luigi (2005). Origins of the War of 1914. I. New York: Enigma Books. ISBN 1-929631-31-6. Belfield, Richard (2005). The Assassination Business: A History of State-Sponsored Murder. New York: Carroll & Graf. ISBN 0-7867-1343-7. Butcher, Tim (2014). The Trigger: Hunting the Assassin Who Brought the World to War. New York: Grove Press. ISBN 978-0-80219-188-5. Dedijer, Vladimir (1966). The Road to Sarajevo. New York: Simon and Schuster. OCLC 400010. MacKenzie, David (1995). Black Hand on Trial: Salonika 1917. Eastern European Monographs. ISBN 978-0-88033-320-7. Magrini, Luciano (1929). Il Dramma Di Seraievo. Origini e responsabilita della guerra europea. Milan. OCLC 8018932. Gioseffi, Daniela (1993). On Prejudice: A Global Perspective. Anchor Books. ISBN 978-0-385-46938-8. Owings, W.A. Dolph. (1984). 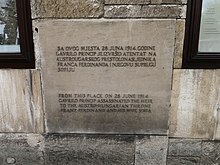 The Sarajevo Trial. Chapel Hill, NC. : Documentary Publications. ISBN 0-89712-122-8. De Schelking, Eugene (1918). Recollections of a Russian Diplomat, The Suicide of Monarchies. New York: McMillan Co.. OCLC 1890657. Johnson, Wes (2007). Balkan Inferno: Betrayal, War and Intervention, 1990-2005. Enigma Books. ISBN 978-1-929631-63-6. Mitrović, Andrej (2007). Serbia's Great War, 1914–1918. Purdue University Press. ISBN 978-1-55753-477-4. Strachan, Hugh (2001). The First World War. I: To Arms. Oxford: Oxford University Press. ISBN 978-0-19-926191-8. Pearson, Owen (2005). Albania in the Twentieth Century, A History: Volume I: Albania and King Zog, 1908-39. I.B.Tauris. ISBN 9781845110130. https://books.google.me/books?isbn=1845110137. Sugar, Peter F. (1999). East European Nationalism, Politics and Religion. Farnham, England: Ashgate Publishing. ISBN 978-0-86078-806-5. Taylor, A. J. P. (1963). The First World War: An Illustrated History. London: Penguin Books. ISBN 0-14-002481-6. Trydar-Burzinski, Louis (1926). Le Crépuscule d'une Autocratie. Florence. OCLC 473403651. Craig, John S. (2005). Peculiar Liaisons: In War, Espionage, and Terrorism in the Twentieth Century. Algora Publishing. ISBN 0-87586-331-0. Remak, Joachim (1971). The First World War: Causes, Conduct, Consequences. Wiley. ISBN 0-471-71634-0. MacKenzie, David (1989). 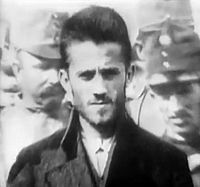 Apis, the Congenial Conspirator: the Life of Colonel Dragutin T. Dimitrijević. East European Monographs. ISBN 0-88033-162-3. Willmott, H. P. (2003). World War I. Dorling Kindersley. ISBN 978-0-7894-9627-0. https://books.google.com/books?id=4sGIQgAACAAJ. MacMillan, Margaret (2013). The War That Ended Peace: How Europe Abandoned Peace for the First World War. Profile Books. ISBN 9781847654168. Tuchman, Barbara (2009). The Guns of August: The Outbreak of World War I. Random House Publishing Group. ISBN 9780307567628. Bataković, Dušan T. (1996). The Serbs of Bosnia & Herzegovina: History and Politics. Dialogue Association. https://books.google.com/books?id=k3xpAAAAMAAJ. Ponting, Clive. Thirteen Days, Chatto & Windus, London, 2002. Stoessinger, John. Why Nations Go to War, Wadsworth Publishing, 2007.